"What is a test, and what does it really measure?" I often get the sense that more than a few stakeholders and policy makers in education don't take a lot of time to think carefully about this question. There aren't many people who would claim that a test score, by itself, is the ultimate product of education. And yet test scores dominate discussions of education policy: if your beloved program can show a gain in a test outcome, you're sure to cite that gain as evidence in favor of it. To make their case, the CEPR researchers do what many others have done: take test scores from students, input them into a sophisticated statistical model, and compare the gains for various groups. To be clear, I do think using test scores this way is fine -- to a point. Test outcomes can and often do contain useful information that, when properly used, tell us important things. But we always have to remember that a test is a sample of knowledge or ability at a particular point in time. Like all samples, test outcomes are subject to error. Give a child who ate a good breakfast and got enough sleep a test in a quiet room with the heat set properly, and you'll get one score. Give that same child the same test but on an empty stomach in a freezing cold room, and you'll almost certainly get something else. The variation in outcomes here illustrates a critical point: Often the scores on a test vary because of factors that have nothing to do with what the test is trying to measure. Psychometricians will often talk about construct validity: the extent to which a test is measuring what it is supposed to be measuring. Making a valid test requires not only creating test items that vary based on what we're trying to measure; it also requires defining what we're trying to measure. Take, for example, New Jersey's statewide assessments in Grades 3 through 8 -- assessments required by federal law. For a number of years, the state administrated the NJASK: the New Jersey Assessment of Skills and Knowledge. It was a paper-and-pencil test that assessed students in two domains: math and English language arts (ELA). Those are very big domains. What, exactly, comes under ELA? Reading and writing, sure... but reading what? Fiction? Informational texts? Toward what end? Comprehension, sure... but what does that mean? How does anyone demonstrate they comprehend something? By summarizing the text, or by responding to it in an original way? Is there a fool-proof way to show comprehension? And at what level? These questions aren't merely a philosophical exercise -- they matter when building a test. What goes into the construct we are trying to measure? And, importantly, do the tests we give vary based on what we intend to use the tests to measure? In the case of the recent Newark research, the economists who conducted the study made an assumption: they believed the test scores they used vary based on the actions of school systems, which implement programs and policies of various kinds. They assumed that after applying their models -- models that attempt to strip away differences in student characteristics and abilities to learn -- the variation in outcomes can be attributed to things the Newark publicly-financed schools, including the charter schools, do that differ from schools in other parts of the state. It's a big assumption. It requires showing that the policies and programs implemented can be documented and, if appropriate, measured. It requires showing that those policies and programs only took place in Newark. And it requires making the argument that the variation found in test outcomes came only from those policies and programs -- what social scientists would call the treatment. In 2015, New Jersey switched its statewide exam from the NJASK to the PARCC: the Partnership for Assessment of Readiness for College and Careers. PARCC is (mostly) a computerized exam. Its supporters often claim it's a "better" exam, because, they say, it measures things that matter more. I'm not going to get into that debate now, but I will note that, so far as I know, no one ever conducted a validity study of the PARCC compared to the NJASK. In other words: we're not sure how the two tests differ in what they measure. What I can say is that everyone agrees the two exams are different. From what I've seen and heard from others, the PARCC math exam relies more on language skills than the NJASK math exam did, requiring students to do more verbal problem solving (which would put non-native English speakers at a disadvantage). The PARCC ELA exam seems to put more emphasis on writing than the NJASK, although how that writing is graded remains problematic. Until 2015. The Abbotts, as a group, saw gains compared to the rest of the state -- but Newark saw greater gains. Whether the size of those gains is educationally significant is something we'll talk about later; for right now, let's acknowledge they are statistically significant. Newark's gains in "growth," relative to other, similar New Jersey districts, occurred in the same year the state switched exams. And it's not just the CEPR research that shows this. As Bruce Baker and I showed in our review of that research, the state's own measure of growth, called Student Growth Percentiles (SGPs), also show a leap in achievement gains for Newark in the same year. Again, the red line is the dividing point between the NJASK and the PARCC. In this case, however, we break down the districts into the Newark Public Schools, Newark's charter schools, and only those Abbotts in the same county as Newark. The districts close to Newark with similar demographics had similar gains in achievement "growth." 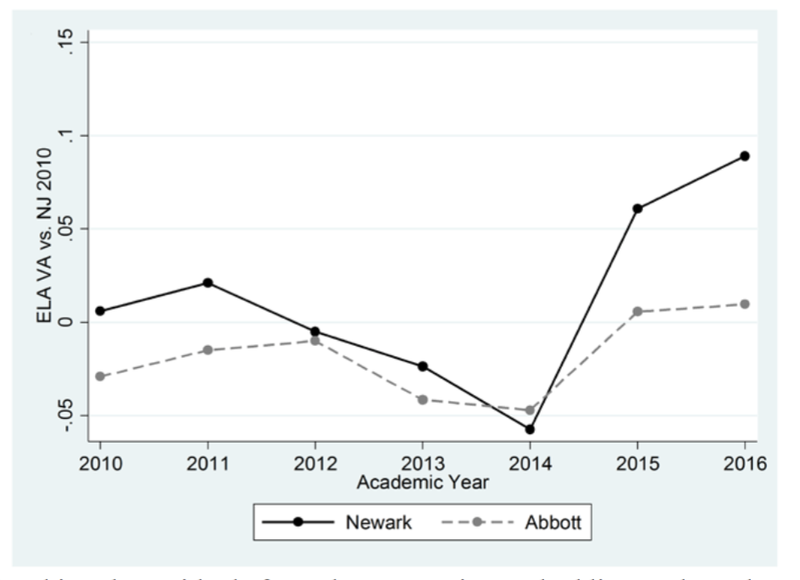 Let's step back and remember what the CEPR study was trying to understand: how a series of policies, initiated by Zuckerberg's donation, affected test score growth in Newark. What would we have to assume, based on this evidence, to believe that's true? That the Newark reforms, which began in 2011, didn't kick in until 2015, when they suddenly started affecting test scores. That the gains in the other Essex County Abbott districts (Irvington, Orange, and East Orange) were caused by some other factor completely separate from anything affecting Newark. That the switch from the NJASK to the PARCC didn't create any gains in growth that were unrelated to the construct the tests are purportedly measuring. Test makers will sometimes refer to the concept of construct-irrelevant variation: that test outcomes will vary because things we do not want them to measure still affect the scores. If two children with equal mathematical ability take a computerized test, but one has greater facility in using a computer, their test scores will differ. The problem is that we don't want their scores to differ, because we're trying to measure math ability, not familiarity with computers. Did Newark's students -- and Orange's and East Orange's and Irvington's -- do better on the PARCC simply because they felt more at ease with the new PARCC test than students around the rest of the state? Did these districts engage in test prep activities specific to the PARCC that brought scores up, but didn't necessarily reflect better instruction? I'll get into that last sentence more in a future post. 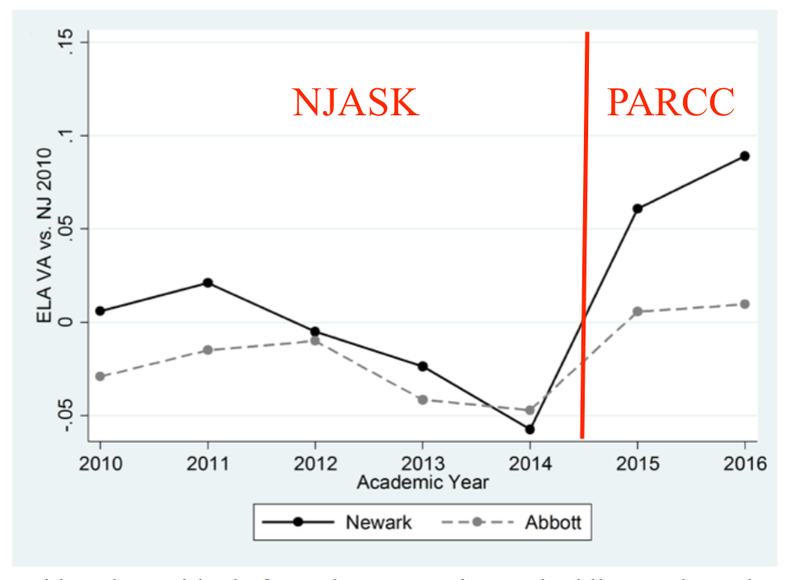 For now, it's enough to note this: Even the CEPR team acknowledges that the most likely explanation for Newark's gains is the state's switch from the NJASK to the PARCC. But aligning instruction with one test more than another is not the same as providing better instruction. Gains like these are not necessarily an indication of curricular or instructional improvements. They are not necessarily brought about by moving students into "better" schools. They could very easily be the result of the tests measuring different things that we don't really want them to measure. We'll talk more about this -- and get the views of a Harvard education expert -- next. Yesterday, the National Education Policy Center published a lengthy report written by Dr. Bruce Baker and myself that looks closely at school "reform" in Newark. I wrote a short piece about our report at NJ Spotlight that gives summarizes our findings. We've also got a deep dive into the data for our report at the NJ Education Policy website. In 2010, Mark Zuckerberg, the CEO and founder of Facebook, went on the The Oprah Winfrey Show and announced that he was giving $100 million in a challenge grant toward the improvement of Newark's schools. Within the next couple of years, Newark had a new superintendent, Cami Anderson. Anderson attempted to implement a series of "reforms" that were supposed to improve student achievement within the city's entire publicly-financed school system. In the time following the Zuckerberg donation, Newark has often been cited by "reformers" as a proof point. It has a large and growing charter school sector, it implemented a teacher contract with merit pay, it has a universal enrollment system, it "renewed" public district schools by churning school leadership, it implemented Common Core early (allegedly), and so on. And so on. If Newark's student outcomes have improved, it has to be because these and other received truths of the "reformers" must be true. But what if the data -- including the research recently cited by Newark's "reformers" -- doesn't show Newark has improved? What if other factors account for charter school "successes"? What if the test score gains in the district, relative to other, similar districts, isn't unique, or educationally meaningful? What if all the "reforms" supposedly implemented in Newark weren't actually put into place? What if the chaos and strife that has dogged Newark's schools during this "reform" period hasn't been worth it? What if Newark, NJ isn't an example of "reform" leading to success, but is instead a cautionary tale? These are the questions we set out to tackle. And in the next series of posts here, I am going to lay out, in great detail, exactly what we found, and explain what the Newark "reform" experiment is actually telling us about the future of American education. One other thing: as I have said before, the "reformers" often appear to misunderstand how research should be used to inform public policy. Often, you will hear them say some variation of this: "We have to do something to improve our schools -- and you can't prove my preferred reform won't make schools better!" 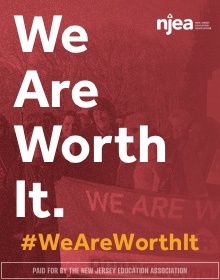 In fact, the burden of proof is on those who contend that charter school expansion, school closures/"renewals," merit pay, Common Core, universal enrollment, and so on will improve schools. If I or others present evidence that calls into question any of these policies, it is up to the promoters of those policies to show why that evidence is not germane. 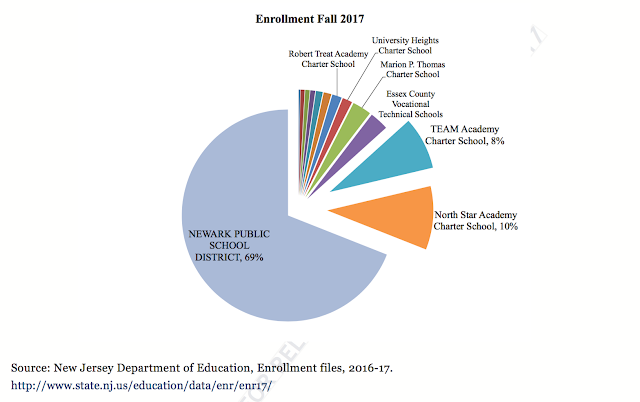 For example: there is no question charter schools -- particularly the Newark charters run by big charter management organizations (CMOs) like TEAM/KIPP and North Star -- enroll very few Limited English Proficient (LEP) students. This puts the burden of educating these children on the public district schools. It explains why charters can spend less on instruction and student support services compared to NPS. It is up to charter defenders to show why this doesn't matter when asserting charter claims of relatively better productivity. The burden of proof is on them, not on those who question their claims.